I started working on my latest book A Christian Survival Guide: A Lifeline to Faith and Growth several years ago, but I had a hard time pitching it. So I just left a summary of it in the “Other Ideas” section of my other book proposals. I started dreaming of the Survival Guide book in 2008 and 2009 as I spoke to one young adult after another about all of the issues and questions that made it hard to be a Christian. Some were really struggling to follow Jesus, while others were on their way out of the faith. They were people at book events, childhood friends, colleagues, and family members. So many people felt stuck, often stymied by doubts or unsatisfying answers from their churches. I could relate. I had many of the same questions and struggles. Hell, evil, and the genocide passages in the Bible were disturbing. The Bible was often used as a weapon against them. The Bible could have errors… and then what? What if I wrote a book that explored the range of Christian responses to each issue? I didn’t want to give pat answers. I just wanted to dive into these topics in short, conversational chapters that provided just enough information to help readers get their bearings and then encourage them to dig deeper. There are heavy chapters about the problem of evil and lighter moments where I offer up parodies of biblical interpretation such as the Papyrus Driven Church—Paul’s definitive guide to church planting via letters. It’s the closest I could come to capturing a real life conversation on the typed page—at least, a real life conversation with me. Still, my wife who is no fan of Christian nonfiction encouraged me to keep at it. She always enjoyed the chapters, and if I can win her over, I like to think that I can win anyone over. My pastor said that the chapter on hell was one of the best treatments he’s read on the topic. Coming to the faith is just the beginning. We also have to survive it. The Christian Survival Guide book doesn’t try to dismiss life’s hardships or faith’s doubts, but it instead walks through them honestly, clinging to both God and authenticity the whole way. What do you do with the Bible’s most disturbing stories? What about those nights that doubt eats away at your insides? 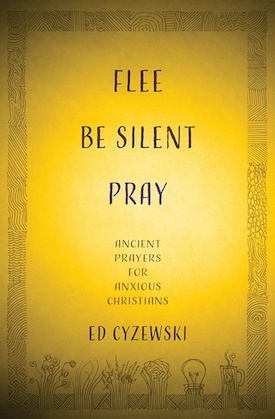 Ed Cyzewski’s new Christian Survival Guide book bravely and honestly delves into questions that each of us face at some point in our faith journey, but may not have the courage to ask. However, you can always dismiss the praise of your wife or your friends. They could be biased. It could still be a pretty terrible book, right? I was still waiting for the first critical review. The ellipsis you see is the reviewer’s one critique of my book. Why hide it? The reviewer wrote that the one thing this book really needed was a list of “suggested books for further reading” at the end of each chapter. Here’s the thing, I provided exactly that, but the entire list is at the end of the book, sorted by chapter. The reading list was the last thing we added, so perhaps it was there in time for the review. Reading list aside, it has been immensely gratifying to know that early readers and reviewers found the book so helpful. While the PW review focused on new Christians as the book’s primary audience, it was originally written for Christians who have unresolved questions or ongoing struggles with their faith. It just turns out that new Christians will relate to many of these questions and struggles, giving the book two very different audiences who are searching for many of the same answers. You can learn more about the book, including a preview of the first chapter and table of contents at the Kregel Publishing website. You can also pre-order the book there or visit Amazon to pre-order. We expect it to release in late July. Do you review books on your blog? The blog tour is scheduled for August 18th.